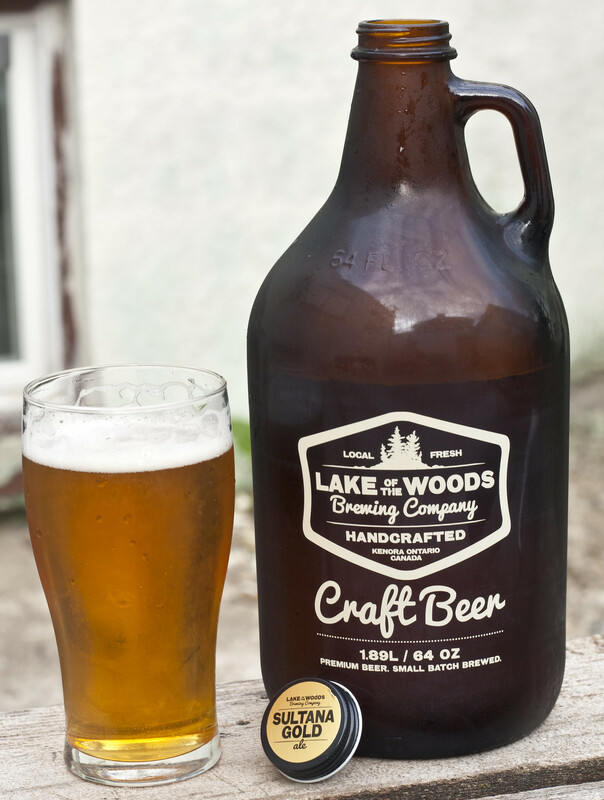 I've heard of Lake of the Woods Brewery for a long time now, but since I don't generally get out of the province, I was never able to try their beer. Heck, the only other time I ever picked up a growler of beer was in Minot at Souris River Brewing - but that growler wasn't for me, unfortunately. My sister was in Northern Ontario seeing her boyfriend, so I got her to drive by Kenora and pick up some beer at Lake of the Woods. She doesn't know what I like so when she buys beer for me (ie xmas), she picks whatever the people at the liquor store recommend. The clerk at LowBrewCo suggested Sultana Gold Ale. Sultana Gold Ale is a light blonde ale made with malted Canadian wheat, pale ale and pilsner malts that tops out at 4.5% ABV, the kind of beer you would see on the patios during summer time. Appearance: Sultana Gold pours a light straw golden body. Lots of micro carbonation, light creamy white head that's thick and frothy at first, but gently goes down. Aroma: A mixture of Canadian pilsner aromas and light pale ale, malted barley, a light toasted bread note, a bit of angel food cake sweetness and a light touch of sweetness. Taste: Your standard pilsner style beer, it has notes of sweet malted barley to give it a bit of sweetness, a bit of light bitterness from the hops, lightly toasty and grainy, comparable to other prairie pilsners like Farmery or Fort Garry. Not bad but I'm not a pilsner fan at all. Overall Thoughts: Will easily appeal to the average beer drinker on the prairies (or Northern Ontario) but not something beer snobs would run and buy. There's a light sweet aftertaste that lingers long after the beer (*hick*) is gone. If you're a fan of pilsners, you will surely enjoy Sultana Gold. For me, I want something with a bit more hops to it. I do appreciate the graininess of the beer, to give it an authentic flavour though.